I’ve been in love with the PawNosh pet bowls since I first laid eyes on them. They are beautiful and remind me of my favorite thing to pick up at the beach – sea glass. Their beauty has always been more than “skin deep” though. The PawNosh pet bowl helps to save the environment. These bowls are made in the US of 100% post-consumer recycled glass – keeping trash out of our landfills. I recently learned that their beauty goes even deeper than that. The bowls are created by by hand at a studio in northern California called Fire & Light. Red. Hot! This is what green glass looks like … at 2400 degrees! I watched an interview with the founders of the Fire & Light glass studio on the show Somebody’s Gotta Do It with Mike Rowe (it’s at the end of the video). The show focused on how Fire & Light has created local jobs and how much the owners, John and Natali McClurg, care about the company and its 16 employees. John and Natali said they never dreamed of making glassware. John was a CPA. One day one of the original 30 founders came into his office and told him about his cool company that was going to create local jobs and a create a local way to use the glass the region was so good at recycling. Unfortunately, they ran out of money in two months. John offered to help them do some strategic planning to get the company back on its feet. John went back to accounting but, years later, he received a call while on a ski trip in Colorado saying that the Fire & Light studio was going to be shut down. John and his wife decided to throw their hearts into the studio to save it. They weren’t sure why they did it but John said it’s become very clear to them in the last couple of years. John said, “The recession was hard and there were some temporary layoffs and people got moved around from one job to another”. Jessie, who had been working with the studio since high school, got moved from day to night shift. John said, “I came out here to the shop at 930 one night just to thank him. He looked at me and says no, thank you for the job”. John went home, told his wife what happened, and said, “This is why we are going to make this work”. John almost teared up when he was telling Mike Rowe that story. Seriously, I want to hug these guys! In my opinion, it’s special people like John and Natali who truly exemplify what it means to be a good person on this earth. I don’t know them but I think of the owners and employees of the Fire & Light studio, and they good they are doing in the world, every time I look at our PawNosh pet bowls. It makes me feel good to know that every purchase of a PawNosh bowl is helping to make the world a better place in many ways. They’re so much more than just amazingly sturdy, beautiful glass bowls. A beautiful shot of our bowls on display at Cold Spring Pet Supply in Cold Spring, NY. A newly remodeled and relaunched small biz curating well-crafted wares for fur babies. Please drop in and support them! It turns out that the Fire & Light studio doesn’t just make pet bowls. They manufacture manufacture a whole line of homewares and accessory products which can be purchased at retailers nationwide or via their website. Their Glow Bug Tea Light and Flowing Heart are on my “to buy” list. I am thinking about who I can give these things to as gifts too. Those hearts are amazing!! 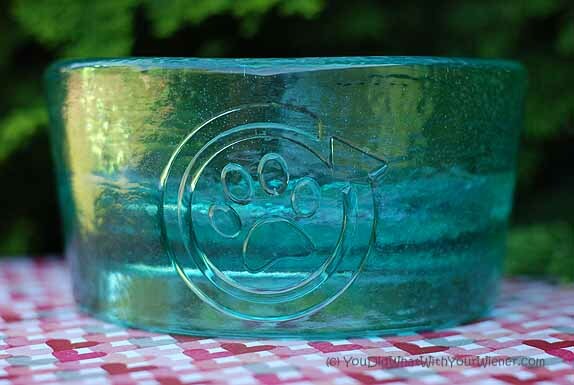 I love the paw nosh bowls, I have always thought they were so beautiful. They are on my want list. I love that story of the company too. As self employed people, we know how hard it is. We saw this on Somebody’s Got to Do It as well and LOVED this whole concept. While we don’t have any of the dishes (maybe someday), they are lovely. That is an extremely beautiful bowl. Love that it is “green” too! I really love the. look of these! Thanks for pointing us in their direction. Those bowls are so gorgeous. I have the blue and I really want the tangerine ones now. Do you have a link to Paw Nosh? It would be a great way to also send business their way. Yes, there should have been one in there. Thanks for pointing out it was missing! They are great. I admit they seem a bit on the expensive side but considering how durable they are, that they are hand made in the US, and come with a lifetime guarantee (so it may be the last bowl that you have to buy) they’re really not. I know! I loved them in when I saw pictures from their Kickstarter campaign and fell harder when I got to see them in person. While I do admire the grass and tangerine colors, my favorite is still the blue. I looked through the products. Where is is the pet bowl in your picture? It’s beautiful and would love to have one. I would even build a stand for it to make it higher and easier for my dog to use. Hi BJ. The Fire & Light studio makes these pet bowls for the PawNosh company but they are not available on their website. To find the bowls (and they come in three colors), please visit the PawNosh website at http://www.pawnosh.com/. We love these bowls and some day, we will own one of our own! How interesting! I love that they are staying small and local. Small glass shows are so cool. I love to watch glass blowing or any kind of glass work. It is so cool to see how glass can be formed into so many different things! The PawNosh bowls are certainly beautiful. I’ve been wanting one for sometime. I’ll probably break down and buy one soon enough. The bowls are even more impressive in person. I got to meet the founders at SuperZoo this past week and they are awesome people and chose working with good people over “production” cost on the bowls. It’s a great story all the way around. I love them as well! They have been on my wishlist for awhile!